I arrived in Australia from Cyprus as a 10 year old with my parents in 1964. When I was 16 I wanted to learn guitar but my parents feared that this would interfere with my school studies. After saving my lunch money for many months I bought my first electric guitar and then a small amplifier with great distortion. I taught myself to play chords and played with many rock & roll/blues bands. I practised many hours every day and within a short period I was able to play fast lead guitar solos. I spent a lot of time working guitar solos from bands like Led Zeppelin, Black Sabbath, Deep Purple, Canned Heat, Eric Clapton, CCR and many others. I also taught myself to play piano during lunchtime at high school as I did not have a piano at home at that time. At this stage, I had no interest in Greek music as it could not offer much for the guitarist, however by the time I was 21 I took interest in Greek music and formed a Greek band by the name of Freedom ( or Eleftheria ) playing at weddings and dances. I got myself a bouzouki and practised for many hours everyday and at the same time trying to keep up with my University studies in Electrical Engineering. I learned many Greek songs but I could not read or write a note of music. This gave me extreme frustration. By good fortune, a few years later I met a great musician and pianist by the name of Nick. He knew nothing about Greek music but was able to just write it down and play it. He joined our band. For the first time I had to communicate	with a Conservatorium trained musician. I was very limited in my communication as I was not able to write the music correctly. This gave me motivation to do something about it. I then went and bought theory books and learned music notation	and theory. This was a new horizon for me and opened my eyes to other musical forms. It also enabled me to start teaching guitar and bouzouki. Teaching guitar was easier as I was able to use many good books that were readily available. Teaching bouzouki was not so easy because there was just no teaching material available. I prepared a lot of my own material to enable me to teach efficiently and productively. 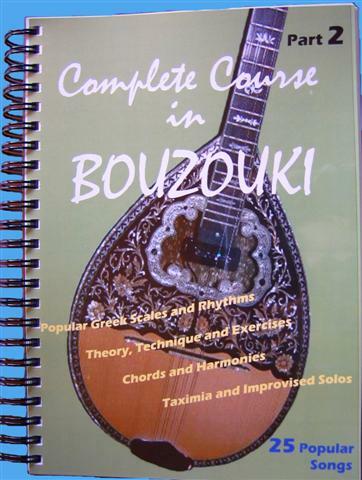 After a few years I accumulated a wealth of bouzouki material and wrote two books in 1986 on bouzouki tuition. These books covered music theory, scales, chords, technique, and lots of songs. I spent hundreds of hours researching information on Greek music and scales in particular. Over the years I accummulated even more teaching material and continued to improve the material and teaching method. 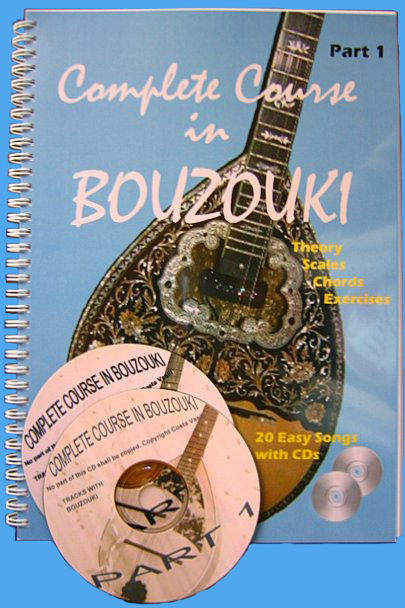 This led me to writing the books titled "Complete Course in Bouzouki - Part 1 and Part 2" in 2004/5. I use these books when I teach the bouzouki. I also have supplementary material that I use. 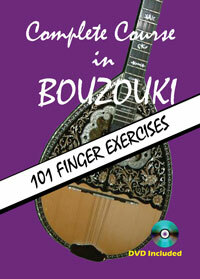 I am currently working on additional books to include this supplementary material to assist bouzouki players to expand their repetoires with popular and challenging instrumentals. I live in Sydney and I work as a Professional Engineer holding an executive position in a large engineering consulting firm in Australia. I am now 57 years young and my passion for music just keeps growing all the time but time is the enemy. The books have been successful beyond my expectations. I am encouraged by the good comments I have received from many people who bought the books but most of all I am grateful that I have been able to help so many people.